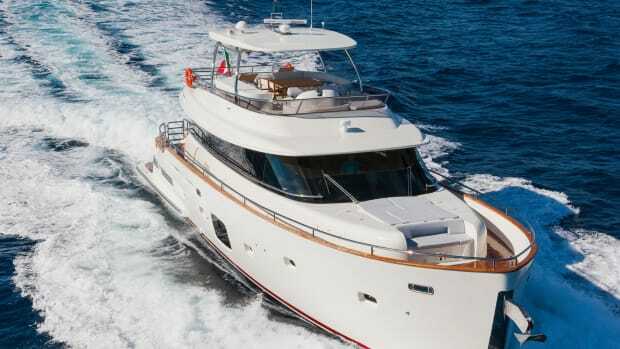 The CNB 76 arrives in the United States packing French flair, generous amenities and appealing performance. John O’Connor, owner of the CNB 76 Sapphire, welcomes me on board with a twinkle in his eye that seems indicative of the sparkling New England day we’ve been dealt: 80 degrees, calm seas and a southeast breeze peaking at 15 knots with barely a cloud in the sky. He’d taken delivery of Sapphire a year before and already had put a few thousand miles under her keel. 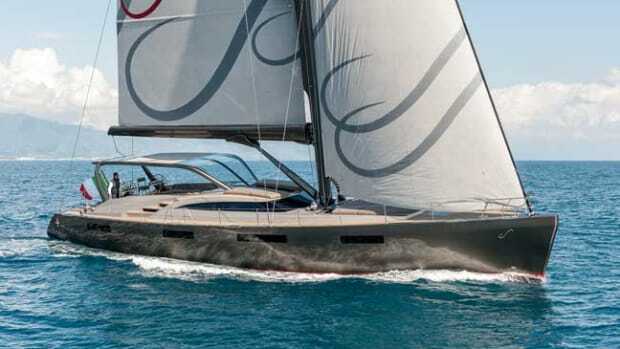 CNB 76 sailing yacht underway. 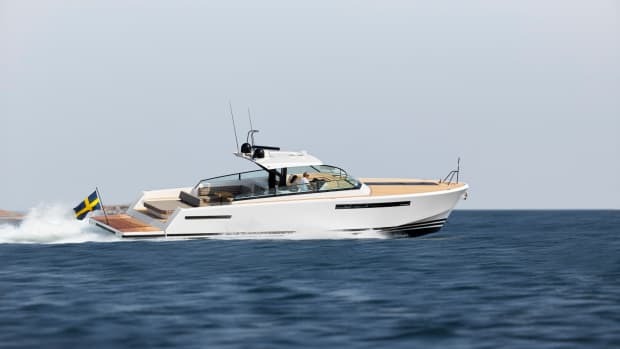 With the 76, Beneteau Group subsidiary CNB Yacht Builders set out to construct a luxury cruiser capable of navigating oceans. I sampled her potential on a sea trial in June, sailing down the Rhode Island shore from Newport to the quaint fishing village of Point Judith. 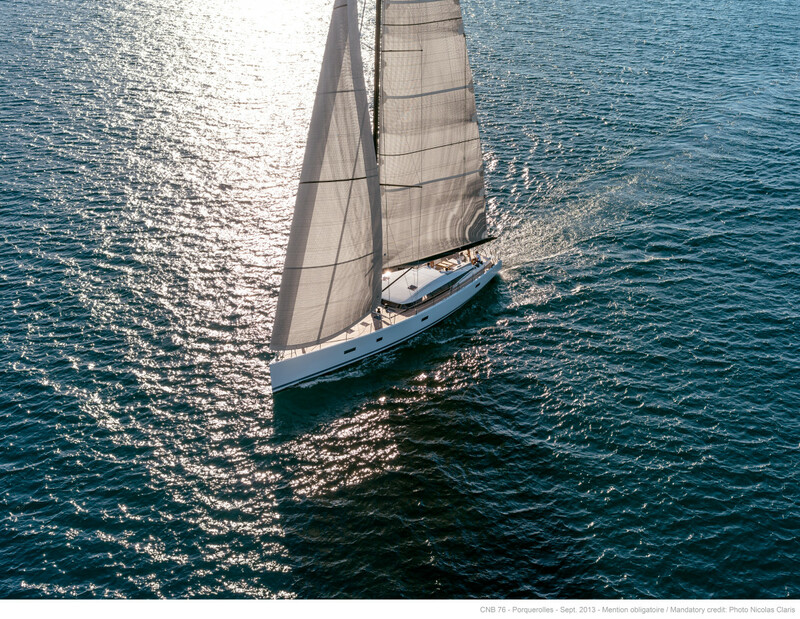 While not exactly an offshore passage, the sail allowed me a solid sense of what cruising aboard the yacht might be like were terra firma nowhere in sight. She was robust and seakindly, and offered heaps of amenities that a cruising family such as O’Connor’s would appreciate. 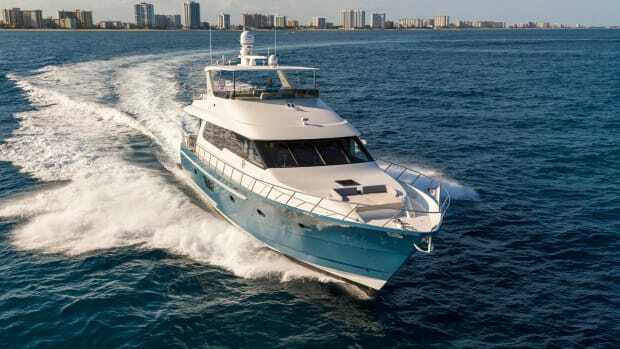 The 76 inspires confidence at her dual helms, each of which has a laminated teak wheel with carbon fiber spokes, a retractable foot brace for added comfort when heeling and an arsenal of Raymarine electronics within arm’s reach. Close-hauled, she felt strong and sturdy, happy to sit on her atypical hard chines and enjoy the ride driven by her powerful mainsail and genoa, which helped us achieve a consistent 10 knots despite an inconsistent 5 to 15 knots of breeze. She was dry and comfortable on all points of sail, and responded well to inputs on the helm. 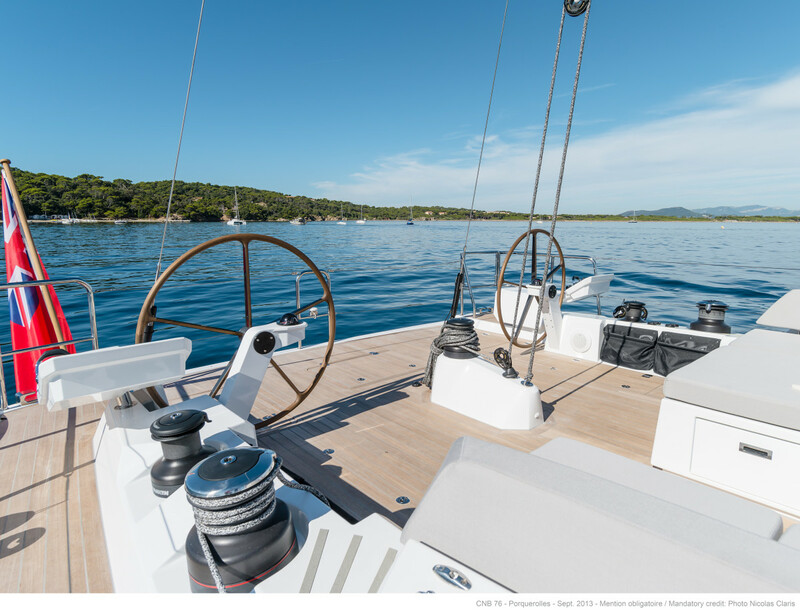 Dockside, bow and stern thrusters with joystick steering simplified maneuvering in tight quarters, making it never too early to uncork the rosé on the way in. Dual helms aft on the CNB 76 sailing yacht. The CNB 76&apos;s cockpit and helm areas are streamlined with a flush deck. For all her might and stability, Sapphire also expressed a tone of elegance à la française. 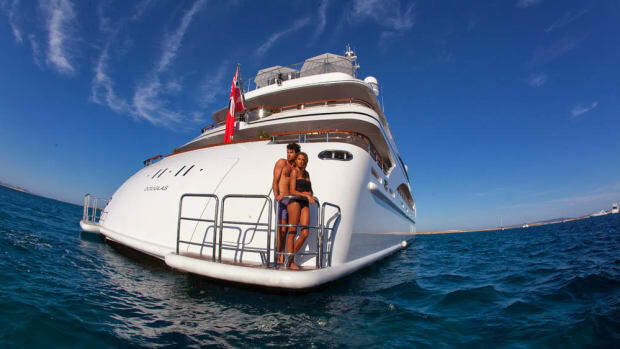 Penned by big-boat designer Philippe Briand, she has a luxury yacht influence that is tangible throughout. The coachroof is stylish and understated—low enough to achieve a cool, contemporary profile, yet with excellent visibility outward from the salon. The coachroof—low enough to achieve a cool, contemporary profile, yet with excellent visibility outward from the salon. 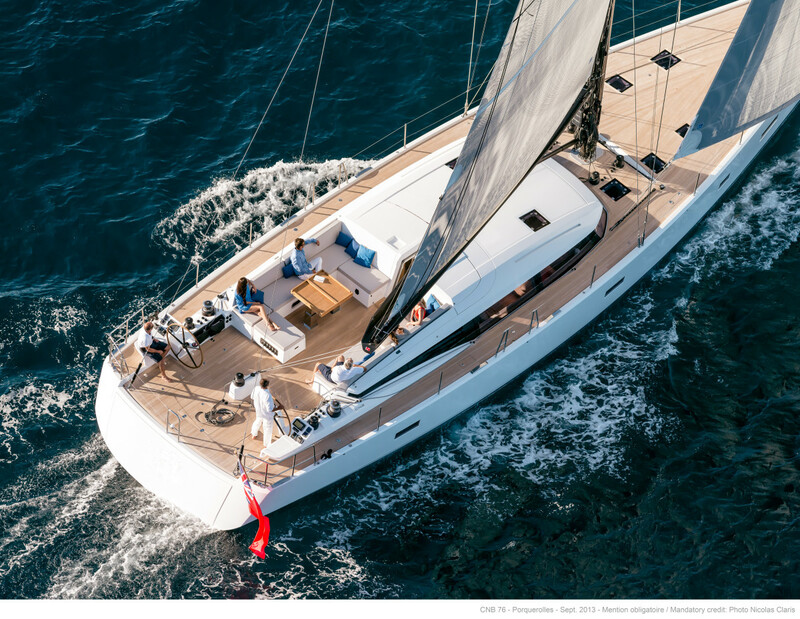 The sole is flush between the helm deck and the cockpit, which allows easy movement between the two, but segregates the steering and sailhandling from the cocktails and hors d’oeuvres. 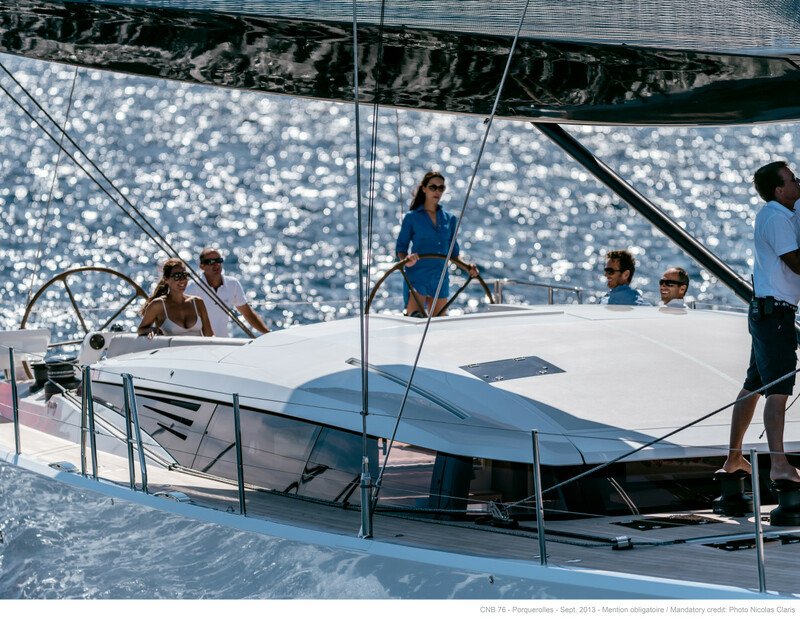 The uncluttered foredeck is seamless, with integrated tracks and flush hatches. Her sail locker is roomy enough to convert to a second crew cabin with two bunks, a head and 7 feet of headroom. The whole anchor system, anchor included, retracts into its locker at the push of a button. Her clever tender garage deserves credit for much of the uncluttered deck space. A hydraulic transom door lowers to reveal the garage and a swim platform. 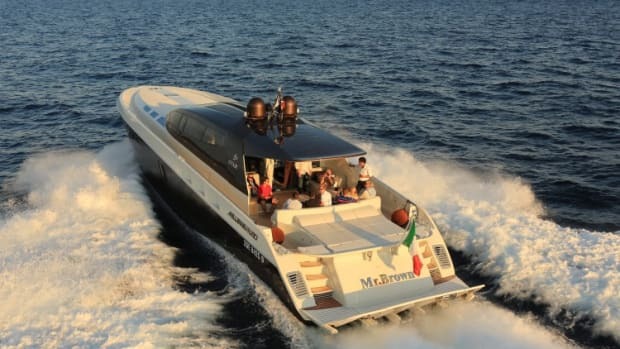 The platform rests just above the water with a ladder for swimming, or it can lower to the waterline for electric deployment of the optional Williams Turbojet 385. The entire process takes about a minute. The interior design by Jean-Marc Piaton is graceful and contemporary. Beneath the subtle curves of the coachroof, the salon is bright and airy thanks to panoramic windows, which seem to magnify the incoming natural light. 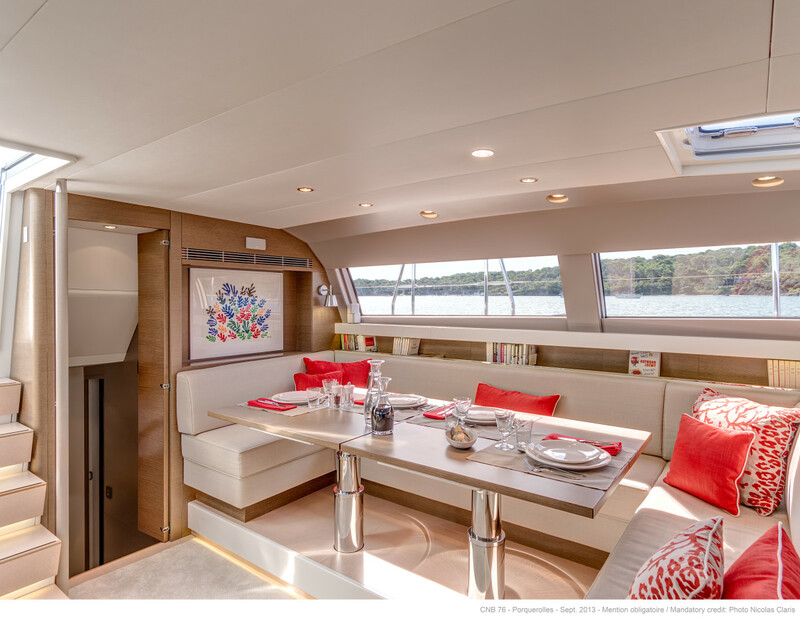 Seating areas designed for heeling offer cozy options on any tack with sea views, even while seated. A modular salon table to port serves eight guests and is adjustable in both height and width. My personal pièce de résistance—and the owner’s as well, it seems—is the lounge to starboard. It converts to two facing armchairs separated by a curious hidden nook in the hull. Starboard side of the salon inside the CNB 76. Note the private bar. 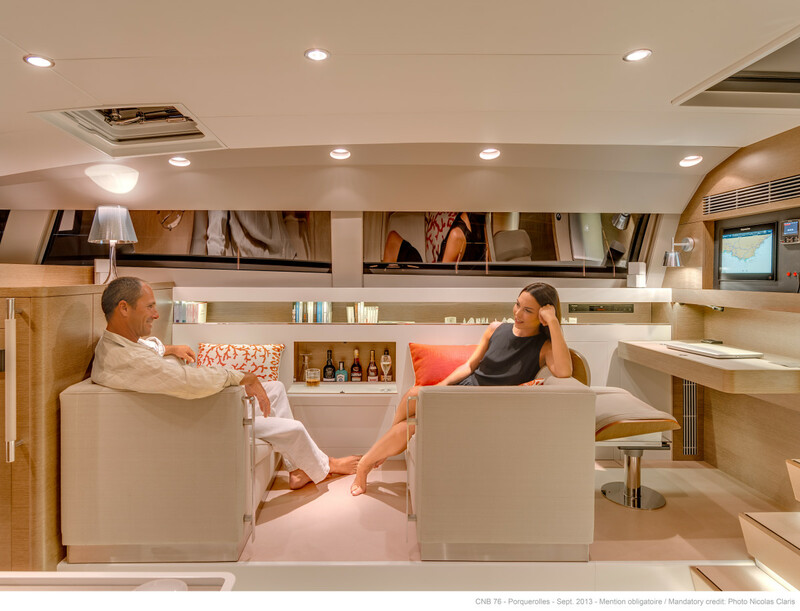 Down the companionway, far forward and away from the action, the owner’s suite feels secluded. It includes a large bookcase, flat-screen TV, slide-out desk and a double wardrobe. The queen-size bed’s headboard is orientated aft for added privacy. Abaft the owner’s stateroom, the two guest staterooms are both ensuite. 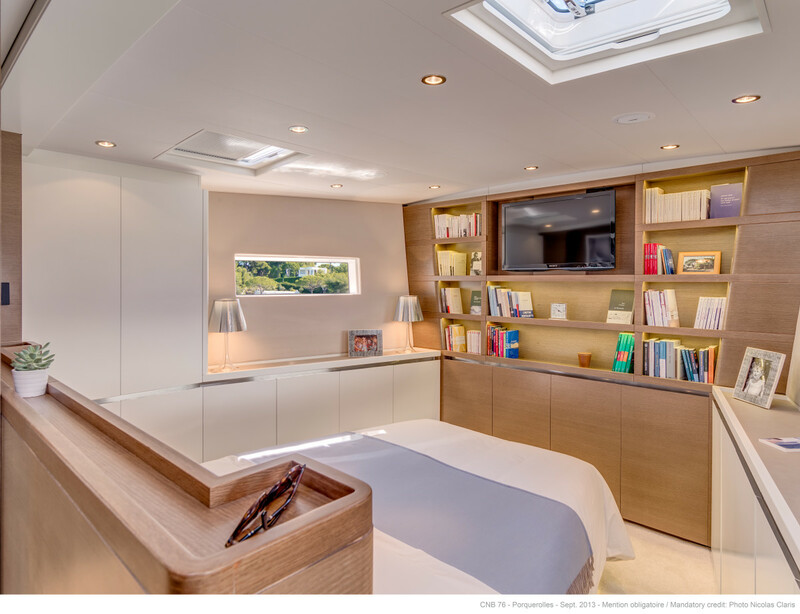 Crew quarters and a well-lit galley are inconspicuous abaft the salon. Airy and welcoming, the galley makes a fine respite for guests to enjoy a casual meal or a cup of coffee. Far forward and away from the action, the owner’s suite feels blissfully secluded. 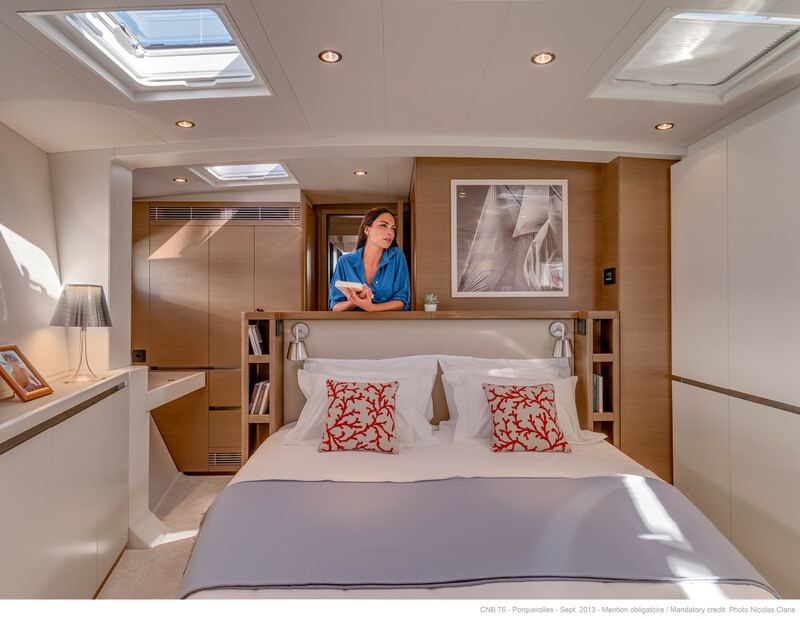 In the owner&apos;s stateroom, the queen-size bed’s headboard is orientated aft for added privacy. 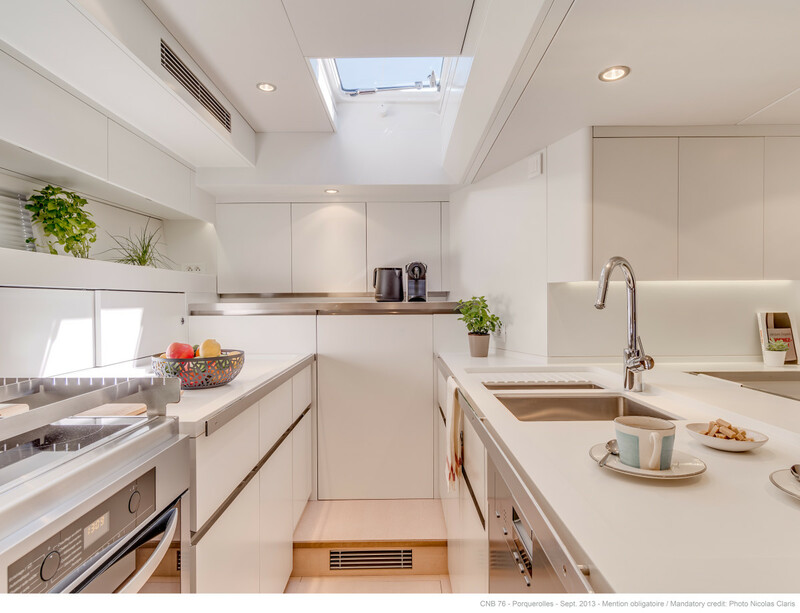 The galley is bright and airy, perfect for enjoying a cup of coffee or quick meal underway. Not only is Sapphire fast under sail, she was also fast out of the build shed. 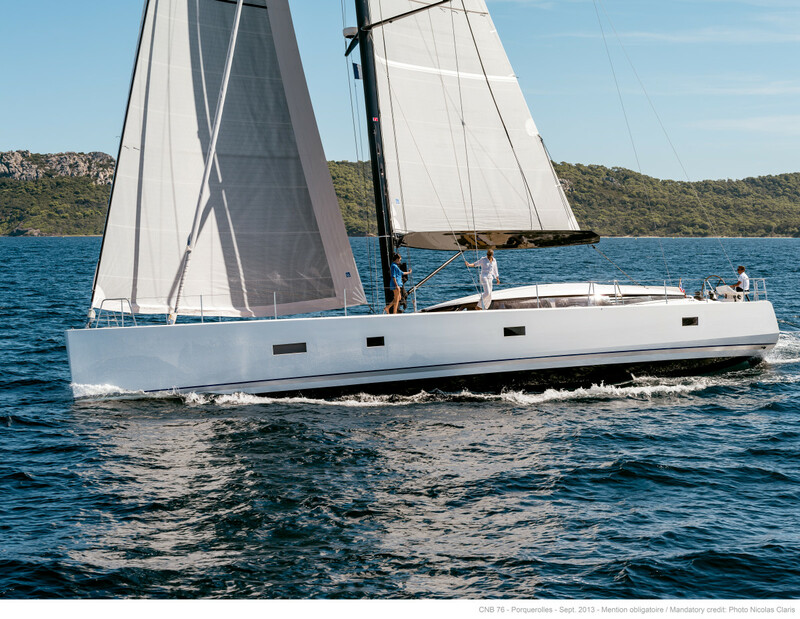 Though a one-off design intended to convey supersailer characteristics, the 76 is technically a production boat. 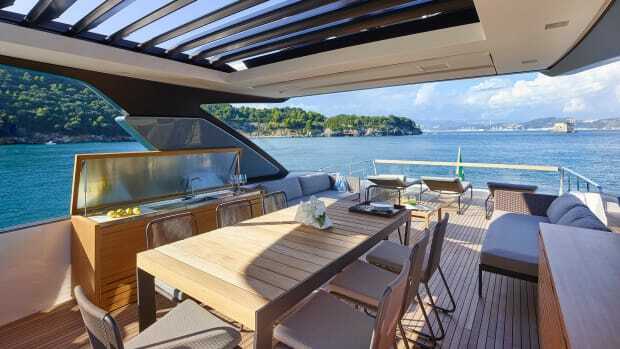 Divided into four modules—master suite, guest cabins, salon and aft section—the pieces are assembled outside of the hull as it is being resin-infused. This construction process has shortened build time to eight months, in turn reducing cost. 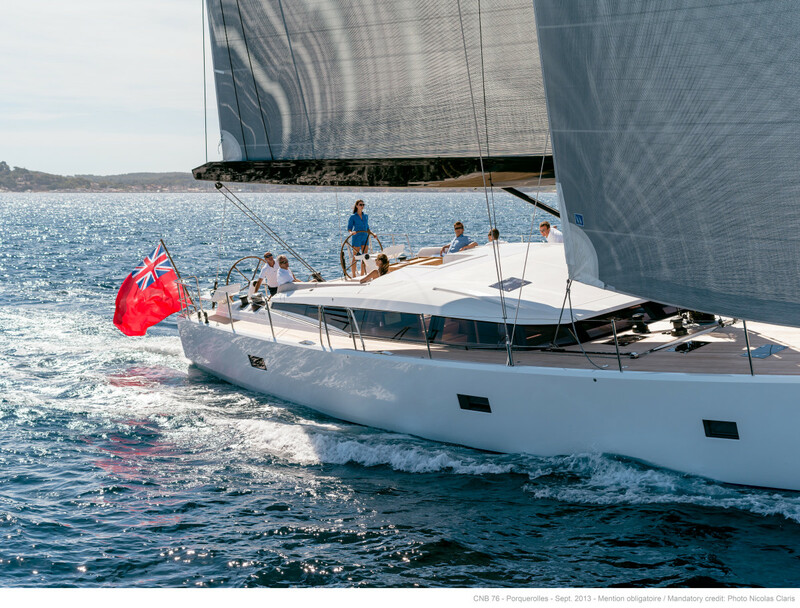 O’Connor’s yacht is hull number seven of the line (12 have been completed to date) and the first CNB 76 to have ventured across the pond, but with the quick build time, Americans might expect to see more dotting the horizon in short order. 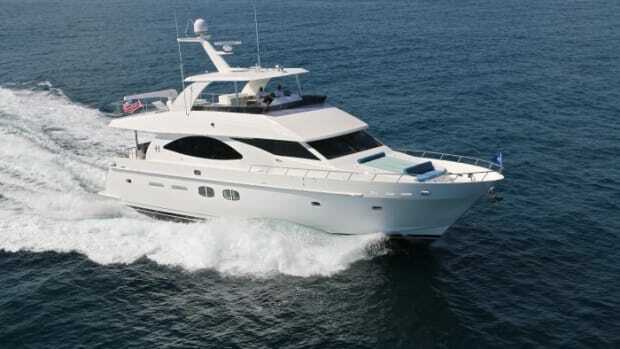 CNB is currently represented in North America by Denison Yacht Sales. Sailing the CNB 76 in Newport, RI. The CNB 76 underway in Newport, RI.